We didn’t know we were lost. We were passing through the first small village on our route. We were happy to find a grocery store so we could replenish our food supplies after eating everything we had with us for dinner the night before. The roads went off in several direction and we went straight ahead. We heard some yelling behind from a town that did not yet seem to be awake. Then honking. A man in a window and another in a car were trying to get our attention. 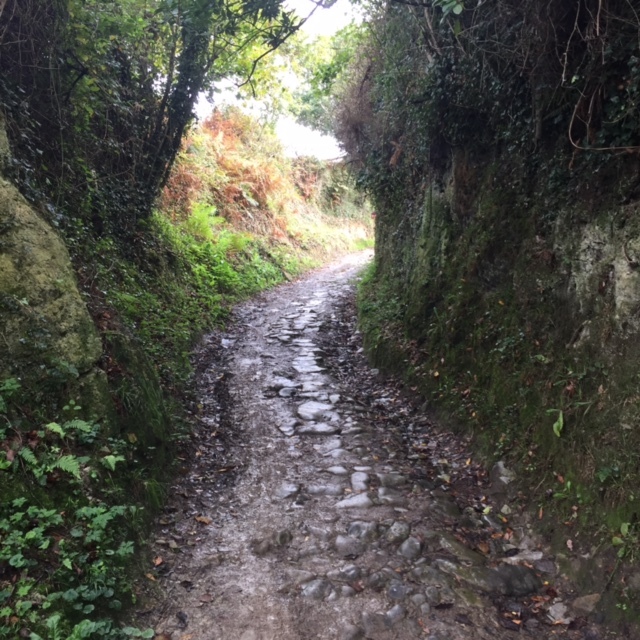 “Camino,” they yelled and pointed in a direction clearly different that the one in which we were headed. Our angels had saved us and set us on the right path. It is funny how often it takes more than one. The damp morning took is up, up , and up in a thick eucalyptus grove. We came across stone walls, and farms and cliffs before heading back down into another valley, where another angel put us on the right path. Again we were climbing until we found the sea. Another spectacular cliff side view and a herd of goats – including the rare Spanish Tree-Dwelling goat. When we created the hill we could see the sandy curve of the beach at Laredo – a popular Spanish seaside resort town where we had planned to end the day. But we continued on. Having learned our lesson the day before, we made reservations in Santoña before continuing on. Our trip was dependent on a ferry that was not acknowledged by Google maps. As we approached the ferry we met the same women we had seen the night before. They had been waiting a long time for this ferry, that supposedly pulls right up the the beach. And it did. ten minutes later we were in the town where Columbus’ ship the Santa Maria was built. A quaint room with a view of the sea was our reward.